The last half-century of solar system exploration has provided insight into the processes, styles and rates of crustal formation on the terrestrial planets and the role that Large Igneous Provinces (LIPs) have played (e.g., Head and Coffin, 1997). An early synthesis (Taylor, 1989) subdivided planetary crustal types into primary crust (in which crust was created from the energy associated with planetary accretion), secondary crust (in which crust was created by partial melting of planetary mantles) and tertiary crust (in which crust was formed by recycling of primary and secondary crust). The Moon is the "type planet" for primary crust; the anorthositic crust is thought to have formed from plagioclase flotation in an early "magma ocean" phase. Secondary crust is seen in many forms, including the Earth's seafloor, the lunar maria (Head and Wilson, 1992; Head, 2004), and the Tharsis rise and huge volcanoes of Mars. Tertiary, continental crust on Earth forms from weathering and recycling at convergent plate boundaries. The Moon and Venus display candidate examples of tertiary crust including steep-sided viscous domes (Wilson and Head, 2003; Ivanov and Head, 1999) that may represent magmatic mixing of basalt and remelted older crustal material. The interplay of crustal formation and lithospheric or thermal evolution is clearly critical in the earliest periods of planetary history, particularly for one-plate planets (Head, 1999). As planets transition from an early phase of accretional heating and decay of radioactive elements, they cool globally and the global state of stress in the lithosphere becomes increasingly contractional. 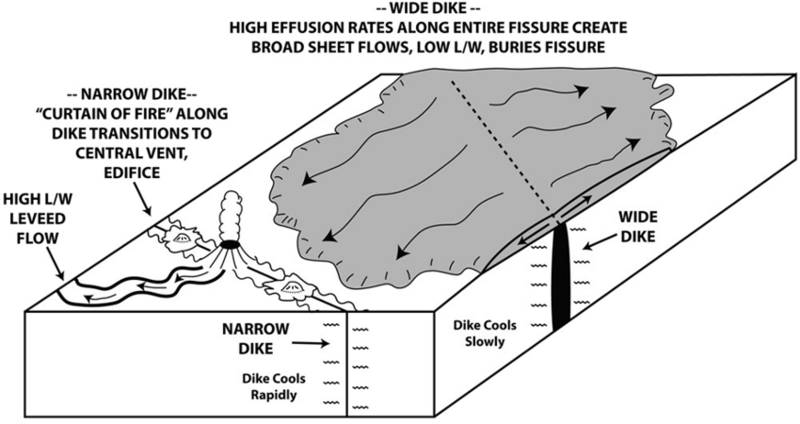 Cooling of the interior also means less magma generation, and an increasingly contractional state of stress in the lithosphere inhibits dike (magma-filled crack) propagation to the surface (e.g., Head and Wilson, 1992; Head, 2004). This trend is readily seen on the Moon: there is a transition from net extension (graben) to net contraction (wrinkle ridges) early in the period of mare basalt volcanism, and subsequent waning of volcanic extrusion into middle lunar history (Solomon and Head, 1980). On Mercury, the extensive series of global contractional features discovered and documented by Mariner 10 (e.g., Strom et al., 1975b), and much more prominent than those on the Moon, also signal a more highly contractional state of stress in the lithosphere, and thus significantly more limited extrusion of magma to the surface and an earlier waning and cessation of surface volcanic activity (Wilson and Head, 2008). Mercury holds a special place in comparative planetology. What does primary crust look like on Mercury? Temperature-pressure conditions on Mercury may not favor the formation of an anorthositic flotation crust, and thus how do we distinguish ancient primary from secondary crust? Secondly, if a more significant global contractional lithospheric stress state occurs on Mercury, does this mean that its earlier history was characterized by a significantly more extensional global stress state? Could early Mercury have been much hotter in its interior, producing much more melt than in the early Moon, and could it have been characterized by a corresponding globally extensional state of stress in the lithosphere that favored the rapid and global extrusion of this magma to the surface to produce high rates of global volcanic resurfacing? Could there have been extensive, perhaps planet-wide, large igneous provinces during this early period in Mercury history? New data from the MErcury Surface, Space ENvironment, GEochemistry, and Ranging (MESSENGER) mission has begun to lift this veil and provide insight into these questions. As reported in a previous LIP of the Month (Head, June, 2010, The Importance of Mercury in Understanding Plutonism and Volcanism in Early Planetary History: Early Planetary Large Igneous Provinces? http://www.largeigneousprovinces.org/10jun), in the three flybys of Mercury prior to insertion of the MESSENGER spacecraft into orbit in March, 2011, evidence was discovered that supported a significant role for volcanic activity in the early history of Mercury: 1) Volcanic vents were found and documented (Head et al., 2008, 2009a) and some had associated deposits interpreted to be of pyroclastic origin, a surprising result since most models of Mercury's formation and early evolution predict that it should be severely depleted in volatiles (Kerber et al., 2009); 2) A variety of geological surface units were revealed by the multiple filters of the MESSENGER imaging systems, showing mineralogical differences between impact craters and basins and the plains that filled them (Murchie et al., 2008; Robinson et al., 2008; Denevi et al., 2009; Fassett et al., 2009); 3) Impact crater size-frequency distributions, made considerably more robust by the higher-resolution image data and more comprehensive coverage, showed that many smooth plains units were demonstrably younger than their surrounding craters and basins (Strom et al., 2008); and 4) Detailed geological relationships revealed by the new data, (embayment, stratigraphic sequences of crater filling, and new morphological features favoring plutonism and intrusion; Head et al, 2008, 2009a,b), all confirmed the important role of volcanism in the early history of Mercury. Following insertion of the MESSENGER spacecraft into Mercury orbit, imaging data revealed a huge expanse of smooth plains in the northern high latitudes that cover ~7% of the surface of Mercury, have surface ages and spectral properties that show no resolvable variation, and reveal no specific source regions or associated edifices (Head et al., 2011). As reported in a previous LIP of the Month (Head and Wilson, June, 2012, A Flood Lava Large Igneous Province on Mercury, http://www.largeigneousprovinces.org/12mar) the Caloris Basin-related (Murchie et al., 2008; Fassett et al., 2009) and northern volcanic plains (Head et al., 2011; Byrne et al., 2013) show no signs of broad, rifted rises, constructional landforms (shield volcanoes), or individual linear, leveed flow fronts. The general characteristics of the plains deposits and features on Mercury strongly suggest that they were emplaced by flood-lava-style eruptions (Wilson and Head, 2008, 2012; Byrne et al., 2013) rather than collections of narrow, leveed flows typical of small dike-emplacement events and more limited-volume surface eruptions (Figure 1). Figure 1. Modes of ascent and eruption of magma and the different manifestations of narrow compared to wide dikes (Wilson and Head, 2012). In summary, magmatism on Mercury appears to be characterized predominantly by: 1) deeper magma sources of large volume, 2) minimal shallow crustal storage of magma, 3) vertically extensive and wide dikes penetrating completely through the lithosphere and crust, and 4) high-volume eruption rates of lava and correspondingly voluminous outpourings producing long/wide lava flows covering extensive areas (Wilson and Head, 2008; 2012). In this environment, large volumes of mantle melt are available for eruption, melt is pressurized, and the lithosphere is in a net state of extension. This induces brittle fractures in overlying lithosphere, resulting in wide, long eruptive fissures, with widths many tens of meters and lengths greater than tens of kilometers. Eruptions from these dikes form broad sheet-flows rather than leveed flows. Lava erupts turbulently at very high fluxes and thermal erosion is maximized. Flows may reach 300 km distance in 20-60 hours and the proximal flow drowns topography. Flows are very likely to be volume-limited: they cease advancing due to supply, not cooling. A hallmark of these types of eruptions is that they will bury vents and fissures, and much of the surrounding cratered topography, leading Wilson and Head (2012) to describe this style of volcanism as “Equipotential Surface Flooding”. But how long did it take for these magmas to erupt and form the northern plains of Mercury, representing 7% of the surface of the planet, and what was their volume? How do we determine the flux? Needed are the size and number of buried craters, estimates of the thickness of the units and information on the different ages of sub-units in the NSP. Here we report on a new analysis (Ostrach et al., 2015) that addresses these critical questions. Two major terrain units dominate the north polar region: the northern heavily cratered terrain (NHCT) and the northern smooth plains (NSP) (Fassett et al., 2011). The northern smooth plains are relatively flat, have fewer superposed impact craters than the surrounding heavily cratered terrain, and are morphologically similar to the lunar maria (e.g., Murray, 1975; Strom et al., 1975a; Head et al., 2008, 2011). Ostrach et al. (2015) examined the local stratigraphy of the north polar region, complementing previous studies of other regions with smooth plains units (Trask, 1975; Strom, 1977; Spudis and Guest, 1988; Strom and Neukum, 1988; Strom et al., 2008, 2011; Fassett et al., 2009; Head et al., 2011; Denevi et al., 2013a; Whitten et al., 2014). Ostrach et al., (2015) determined the size–frequency distribution (SFD) of impact craters in areas of interest to assess how many different units there were in the northern plains, and how much time separated their emplacement. Head et al. (2011) showed previously that two crater populations are observed in the NSP: superposed primary impact craters (“post-plains craters”) and partially to entirely embayed impact craters (“buried craters”). Ostrach et al., (2015) mapped completely buried craters by identifying arcuate wrinkle ridges that are thought to have nucleated above, and so demarcate, buried crater rim crests (Watters, 1993; Waters et al., 2012; Klimczak et al., 2012); craters were described as partially buried when ≤ 25% of the crater rim was exposed. Identification of buried craters is difficult because these impact structures are more susceptible to complete removal from the observed cratering record by emplacement of the plains, as well as by formation of post-plains craters and associated ejecta deposits. Ostrach et al., (2015) adopted a conservative mapping approach to emphasize the unambiguous identification of relict, completely buried craters and thus, the number of buried craters identified should be regarded as a minimum figure. Ostrach et al., (2015) estimated the thickness of the NSP from relations between crater depth and diameter (defined by Pike, 1988, and Barnouin et al., 2012) in a manner similar to the method used by Head et al. (2011). They measured the diameters of buried craters from visible remnants of the crater rim crest, if evident; where no remnant of the rim survives measurements were made from arcuate wrinkle ridges assumed to overlie the original crater rim. Estimated pre-flooding rim heights were derived from fresh craters measurements (Pike, 1988), and the thickness of plains material for a fully buried crater was estimated from the minimum thickness of material needed to cover the crater rim crest. A range of volumes was then estimated by multiplying the rim heights for the smallest and largest fully buried craters, representative of thickness, by the area of the appropriate subsection of the NSP study region. Ostrach et al. (2015) applied a measure of statistical point density to determine if individual subunits with the NSP were identifiable from the post-plains crater population. Older surfaces are expected to have accumulated more craters per area than younger surfaces; therefore, a measure of the areal density of impact craters should reflect variations in relative age and thus indicate regions of resurfacing. Ostrach et al. (2015) used the methodology of Ostrach and Robinson (2014) and determined the areal density of all circular craters ≥ 4 km in diameter for the NSP. Abundant evidence for volcanic emplacement of plains material is provided by embayment relations (e.g., Head et al., 2009a). In the NSP and near NHCT-NSP boundaries there are partially flooded craters (Figures 2-4) that are morphologically similar to Archimedes crater on the Moon. Stratigraphic relationships between an impact crater and nearby volcanic smooth plains units define crater embayment and infilling relations. The Archimedes impact crater example (Figure 4) clearly shows that Imbrium basin-filling mare material embayed Archimedes ejecta deposits and the crater interior was filled with mare material from a different source vent or vents, as indicated by the absence of an obvious breach in the crater rim and wall (Wilhelms and McCauley, 1971; Head, 1982). Similar stratigraphic relationships are observed within the NSP on Mercury (Figure 2-3) and comparison of estimated volcanic fill thickness provides strong evidence for at least two periods of volcanic resurfacing (Head et al., 2011). Buried craters (≥ 25 km in diameter) within partially to completely buried larger craters and basins support the hypothesis that multiple phases of smooth plains emplacement occurred. On the basis of these types of relations, Ostrach et al. (2015) concluded that the original basin depths likely exceeded 4 km, indicating at least 4 km of volcanic fill in the basin interiors. Furthermore, the buried craters within the basins had original rim heights between 0.5 and 1.3 km and thus if those fully buried craters were flooded so that the rim was just barely covered by volcanic material, a minimum thickness of 1.3 km of volcanic material would be required to bury the craters within the basins. On the basis of these data and observations, after initial volcanic resurfacing, there was an interval of time sufficient for major craters to have formed on the volcanic surface, which was subsequently covered by at least one later episode of plains emplacement. Ostrach et al. (2015) suggest that the burial of craters identified in flooded basin interiors reflects at least a second volcanic resurfacing of the NSP, during which the basins and their interiors, including craters superposed on earlier plains material, were infilled and further buried. Figure 2. Northern hemisphere of Mercury (from Ostrach et al., 2015). (a) MESSENGER MDIS WAC orbital monochrome mosaic of the north polar region (400 m per pixel). The mosaic extends from 50°N to 90°N. Eight impact craters are identified with capital letters: A, Abedin, centered at 61.76°N, 349.35°E, diameter (D) = 116 km; G, Goethe (81.50°N, 306.17°E, D = 317 km); H, Hokusai (57.75°N, 16.90°E, D = 114 km); O, Oskison (60.38°N, 145.36°E, D = 122 km); M, Mendelssohn (70.07°N, 102.55°E, D = 291 km); R, Rustaveli (52.55°N, 82.59°E, D = 200 km); S, Strindberg (53.21°N, 223.44°E, D = 189 km); T, Turgenev (65.63°N, 223.64°E, D = 136 km). (b) Sketch map denoting north polar region units: NSP1 (dark gray) and NSP2 (light gray) comprise the NSP; NHCT is the northern heavily cratered terrain. 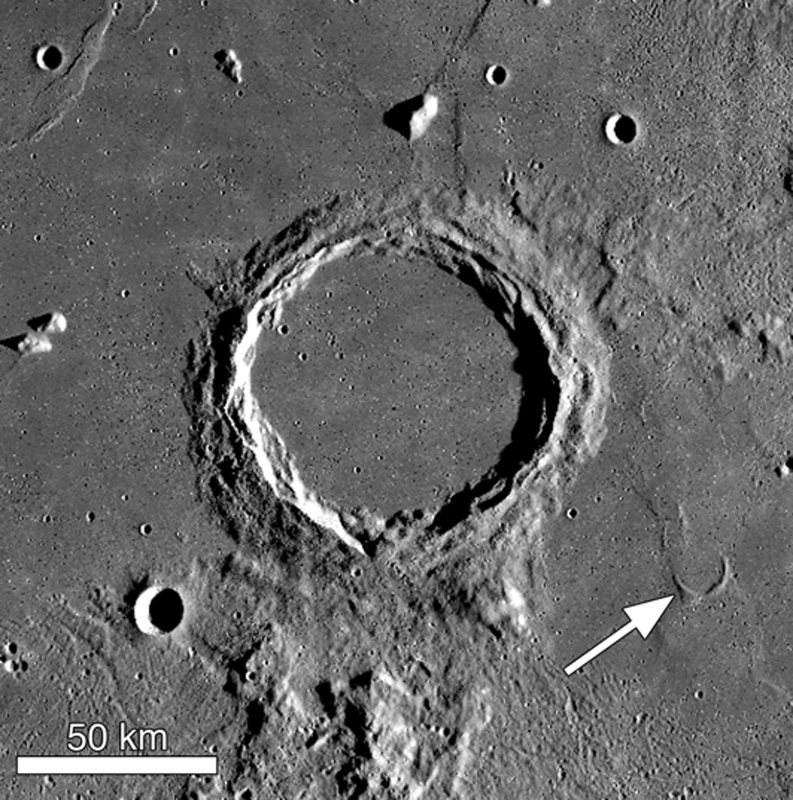 Selected craters are marked as in (a). A region at the pole was excluded from mapping because the determination of stratigraphic relations was rendered difficult by the oblique lighting conditions. Polar stereographic projection. (c) MDIS WAC principal component and ratio composite (second principal component in red, first principal component in green, and the ratio of reflectance at 430 nm to that at 1000 nm in blue; Denevi et al., 2009) for the north polar region of Mercury. NHCT is bluer than the majority of NSP, which tend to be characterized by a reddish-orange color. Several impact craters are labeled: A, Abedin 61.76°N, 349.35°E, D = 116 km; H, Hokusai 57.75°N, 16.90°E, D = 114 km; O, Oskison 60.38°N, 145.36°E, D = 122 km; R, Rustaveli 52.55°N, 82.59°E, D = 200 km. 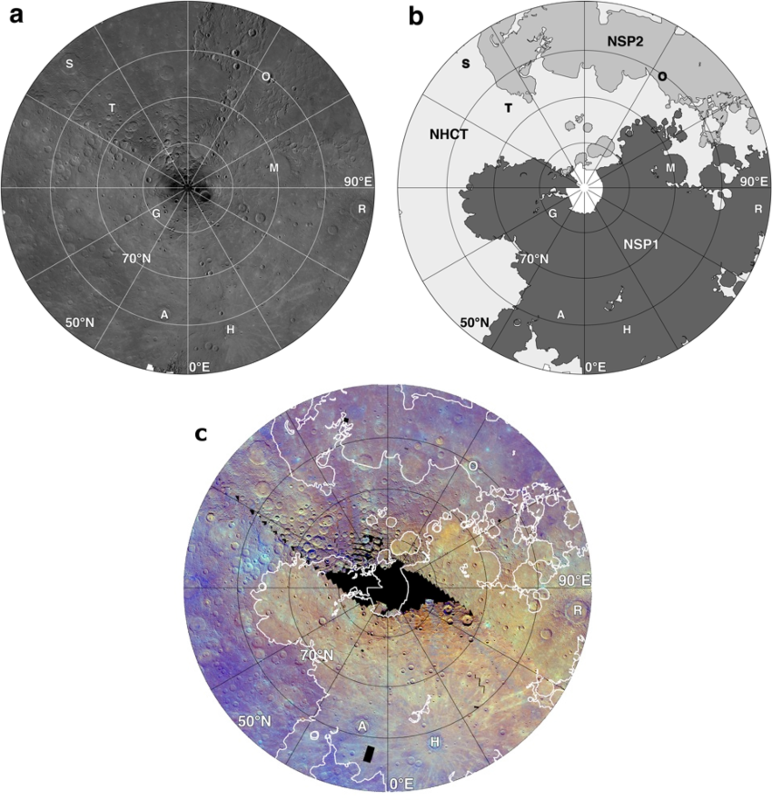 Mosaic is at a resolution of 665 m per pixel and is in polar stereographic projection; black regions are gores in the color coverage. Figure 3. 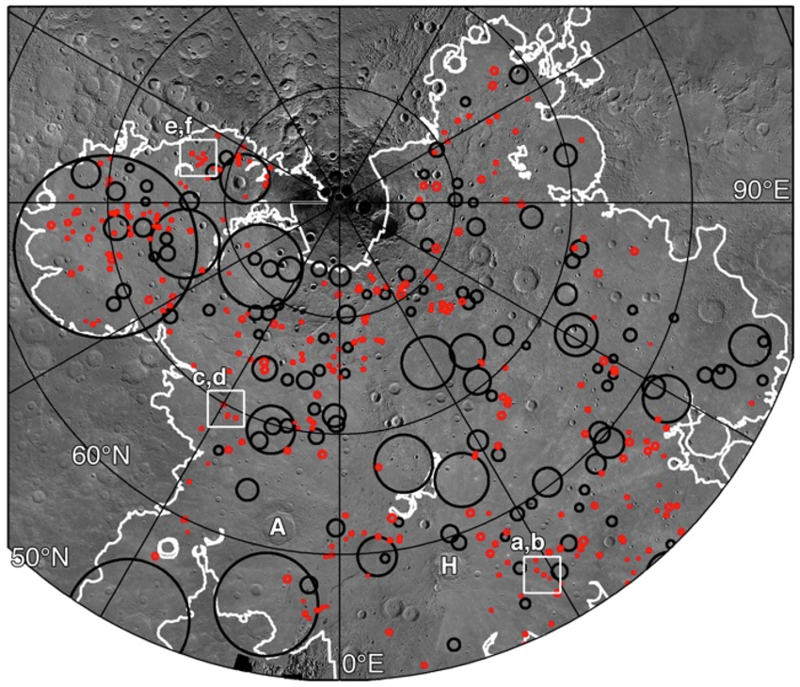 Partially to fully buried craters in the NSP; red circles denote buried craters 4–25 km in diameter, and black circles denote larger (≥ 25 km in diameter) buried craters and basins. The small buried craters are distributed widely across the NSP and provide evidence for multiple stages of volcanic activity. The three white boxes indicate the locations of the detailed views in Fig. 10 of Ostrach et al. (2015). Abedin (A, 61.76°N, 349.35°E, D = 116 km) and Hokusai (H, 57.75°N, 16.90°E, D = 114 km) craters are marked for orientation. From Ostrach et al. (2015). Figure 4. Archimedes crater (29.72°N, 356.01°E, D = ~80 km), located in eastern Mare Imbrium on the Moon, is filled with volcanic smooth plains materials (mare basalt). Mare basalt flows embayed Spurr crater (arrow; 27.92°N, 358.74°E, D = ~13 km) so that only half of the crater rim is presently visible. LROC WAC monochrome mosaic, 400 m per pixel, illumination from the right. From Ostrach et al. (2015). From the geometry of buried craters, Ostrach et al. (2015) have estimated the volume of the NSP to be at least 4 × 106 km3 to 107 km3, a volume consistent with the high-volume, high-effusion-rate style of volcanism predicted for Mercury (Wilson and Head, 2008, 2012). How do these volumes compare to other LIPs? The estimated volume for all lunar mare deposits is ~107 km3 (Head and Wilson, 1992), and large igneous provinces on Earth, such as the Columbia River Flood basalts and the Deccan Traps are estimated to have volumes of 1.3 × 106 km3 and8.2 × 106 km3, respectively (e.g., Coffin and Eldholm, 1994, and references therein). The NSP have volumes lower than the largest-known flood basalts on the Mars and Earth. The Hesperian Ridged Plains on Mars, which cover ~30% of the planet, have an estimated volume of ~4 × 107 km3 (Head et al., 2002). The volume of the terrestrial Greater Ontong Java igneous province (Ontong Java combined with Nauru and other Ocean Basin Flood Basalts adjacent to Ontong Java, estimated to be ~6 × 107 km3; Coffin and Eldholm, 1994; Ingle and Coffin, 2004) along with reconstructed volumes for Manihiki and Hikurangi Oceaninc Plateaus (Taylor, 2006) yield a total volume of ~7 × 107 km3 (Ernst, 2014). How many different surface units are observed in the NSP and what are their ages? Multispectral color differences are absent (or currently undetectable) within the NSP, so Ostrach et al. (2015) used the areal density mapping technique to search for subunits within the NSP distinguishable by crater retention age. Widespread areas of moderate areal density of impact craters are observed in the NSP, consistent with a randomly distributed crater population. Several iterations of synthetic areal density maps (Ostrach et al., 2015) all exhibit patchy areas of high and low density interspersed within a spatially extensive region of moderate density, indicating that such density variations are expected for a random distribution. Ostrach et al. (2015) concluded that regions of high and low density observed in the measured areal density map are similar to those observed in the synthetic density maps, but then undertook visual assessment of such areas to determine if those regions represent geological differences rather than statistical fluctuations. They found that photogeological observations confirmed that areas with locally low crater density primarily result from impact-related modification of the NSP. Ostrach et al. (2015) concluded that the extensive areas of moderate crater density across the NSP are consistent with a final major volcanic resurfacing event that was restricted to a relatively short interval of geological time. Moreover, the measured crater density reflects a randomly distributed crater population, without clear boundaries between subunits, as demonstrated by comparison with synthetic areal density maps determined from random point distributions. These results suggest that the most recent (and probably last) episode of large-scale volcanic resurfacing within the NSP encompassed nearly the entire region, an interpretation consistent with morphological observations. In summary, the northern smooth plains constitute ~7% of the surface area of Mercury and are one of two major largest occurrences of smooth plains on Mercury. No conclusive volcanic landforms are identified within the NSP; morphological and structural evidence is consistent, however, with a volcanic origin for the plains and supports the hypothesis that the NSP were formed rapidly by large volumes of high-temperature, low-viscosity lava, a conclusion also consistent with the high-volume, high-effusion style of volcanism predicted for Mercury (Wilson and Head, 2008, 2012). From buried crater rim height estimates (Ostrach et al., 2015, estimate the NSP to be regionally 0.7–1.8 km thick) a conservative volume of the NSP is between 4 × 106 km3 and 107 km3. From its observed post-plains crater population, we infer that the NSP formed by the voluminous outpouring of volcanic material over a short interval of geologic time. In particular, the areal density of impact craters is indistinguishable from a random population, implying that the last resurfacing phase encompassed the full current extent of the NSP. These results suggest that the most recent outpouring of volcanic material resurfaced the majority of the region, and that this volcanic flooding emplaced the NSP over a relatively short interval of geologic time, perhaps 100 My or less. Current estimates for the cratering rate of Mercury indicate that the NSP and other volcanic plains units were emplaced more or less contemporaneously with the primary episode of mare formation on the Moon. Barnouin, O.S., Zuber, M.T., Smith, D.E., Neumann, G.A., Herrick, R.R., Chappelow, J.E., Murchie, S.L., Prockter, L.M., 2012. The morphology of craters on Mercury: Results from MESSENGER flybys. Icarus 219, 414–427. http://dx.doi.org/10.1016/j.icarus.2012.02.029. Byrne, P.K., Klimczak, C., Williams, D.A., Hurwitz, D.M., Solomon, S.C., Head, J.W., Preusker, F., Oberst, J., 2013. An assemblage of lava flow features on Mercury. J. Geophys. Res. Planets 118, 1303–1322. http://dx.doi.org/10.1002/jgre.20052. Coffin, M.F., Eldholm, O., 1994. Large igneous provinces: Crustal structure, dimensions, and external consequences. Rev. Geophys. 32, 1–36. http://dx.doi.org/10.1029/93RG02508. Denevi, B.W., Robinson, M.S., Solomon, S.C., Murchie, S.L., Blewett, D.T., Domingue, D.L., McCoy, T.J., Ernst, C.M., Head, J.W., Watters, T.R., Chabot, N.L., 2009. The evolution of Mercury’s crust: A global perspective from MESSENGER. Science 324, 613–618. http://dx.doi.org/10.1126/science.1172226. Denevi, B.W., Ernst, C.M., Meyer, H.M., Robinson, M.S., Murchie, S.L., Whitten, J.L., Head, J.W., Watters, T.R., Solomon, S.C., Ostrach, L.R., Chapman, C.R., Byrne, P.K., Klimczak, C., Peplowski, P.N., 2013a. The distribution and origin of smooth plains on Mercury. J. Geophys. Res. Planets 118, 891–907. http://dx.doi.org/10.1002/jgre.20075. Fassett, C.I., Head, J.W., Blewett, D.T., Chapman, C.R., Dickson, J.L., Murchie, S.L., Solomon, S.C., Watters, T.R., 2009. Caloris impact basin: Exterior geomorphology, stratigraphy, morphometry, radial sculpture, and smooth plains deposits. Earth Planet. Sci. Lett. 285, 297–308. http://dx.doi.org/10.1016/j.epsl.2009.05.022. Fassett, C.I., Kadish, S.J., Head, J.W., Solomon, S.C., Strom, R.G., 2011. The global population of large craters on Mercury and comparison with the Moon. Geophys. Res. Lett. 38, L10202. http://dx.doi.org/10.1029/2011GL047294. Head, J.W., 1982. Lava flooding of ancient planetary crusts: Geometry, thickness, and volumes of flooded lunar impact basins. Moon Planets 26, 61–88. http://dx.doi.org/10.1007/BF00941369. Head, J.W., 1999. Surfaces and interiors of the terrestrial planetary bodies, in: Beatty, J.K., Petersen, C.C., Chaikin, A. (Eds. ), The New Solar System. Sky Publishing, Cambridge, MA, pp. 157-173. Head, J.W., Coffin, M.F., 1997. Large igneous provinces: A planetary perspective, in: Mahoney, J.J., Coffin, M.F., (Eds), Large igneous provinces: Continental, oceanic, and planetary flood volcanism, Geophysical Monograph 100. American Geophysical Union, Washington, D. C., pp. 411-438. Head III, J.W., Wilson, L., 1992. Lunar mare volcanism: Stratigraphy, eruption conditions, and the evolution of secondary crusts. Geochim. Cosmochim. Acta 56, 2155–2175. http://dx.doi.org/10.1016/0016-7037(92)90183-J. Head III, J.W., Kreslavsky, M.A., Pratt, S., 2002. Northern lowlands of Mars: Evidence for widespread volcanic flooding and tectonic deformation in the Hesperian Period. J. Geophys. Res. 107 (E1), 5003, http://dx.doi.org/10.1029/2000JE001445. Head, J.W., Murchie, S.L., Prockter, L.M., Robinson, M.S., Solomon, S.C., Strom, R.G., Chapman, C.R., Watters, T.R., McClintock, W.E., Blewett, D.T., Gillis-Davis, J.J., 2008. Volcanism on Mercury: Evidence from the first MESSENGER flyby. Science 321, 69–72. http://dx.doi.org/10.1126/science.1159256. Head, J.W., Murchie, S.L., Prockter, L.M., Solomon, S.C., Chapman, C.R., Strom, R.G., Watters, T.R., Blewett, D.T., Gillis-Davis, J.J., Fassett, C.I., Dickson, J.L., Morgan, G.A., Kerber, L., 2009a. Volcanism on Mercury: Evidence from the first MESSENGER flyby for extrusive and explosive activity and the volcanic origin of plains. Earth Planet. Sci. Lett. 285, 227–242. http://dx.doi.org/10.1016/j.epsl.2009.03.007. Head, J.W., Murchie, S.L., Prockter, L.M., Solomon, S.C., Strom, R.G., Chapman, C.R., Watters, T.R., Blewett, D.T., Gillis-Davis, J.J., Fassett, C.I., Dickson, J.L., Hurwitz, D.M., Ostrach, L.R., 2009b. Evidence for intrusive activity on Mercury from the first MESSENGER flyby. Earth Planet. Sci. Lett. 285, 251–262. http://dx.doi.org/10.1016/j.epsl.2009.03.008. Head, J.W., Chapman, C.R., Strom, R.G., Fassett, C.I., Denevi, B.W., Blewett, D.T., Ernst, C.M., Watters, T.R., Solomon, S.C., Murchie, S.L., Prockter, L.M., Chabot, N.L., Gillis-Davis, J.J., Whitten, J.L., Goudge, T.A., Baker, D.M.H., Hurwitz, D.M., Ostrach, L.R., Xiao, Z., Merline, W.J., Kerber, L.A., Dickson, J.L., Oberst, J., Byrne, P.K., Klimczak, C., Nittler, L.R., 2011. Flood volcanism in the northern high latitudes of Mercury revealed by MESSENGER. Science 333, 1853–1856. http://dx.doi.org/10.1126/science.1211997. Ingle, S., Coffin, M.F. 2004. Impact origin for the greater Ontong Java Plateau?. Earth and Planetary Science Letters 218, 123 – 134. Ivanov, M.A., Head, J.W., 1999. The stratigraphic and geographic distribution of steep-sided domes on Venus: Preliminary results from regional geologic mapping and implications for their origin. J. Geophys. Res. 104, 18,907-18,924. Kerber, L.A., Head, J.W., Solomon, S.C., Murchie, S.L., Blewett, D.T., Wilson, L., 2009. Explosive volcanic eruptions on Mercury: Eruption conditions, magma volatile content, and implications for interior volatile abundances. Earth Planet. Sci. Lett. 285, 263–271. http://dx.doi.org/10.1016/j.epsl.2009.04.037. Klimczak, C., Watters, T.R., Ernst, C.M., Freed, A.M., Byrne, P.K., Solomon, S.C., Blair, D.M., Head, J.W., 2012. Deformation associated with ghost craters and basins in volcanic smooth plains on Mercury: Strain analysis and implications for plains evolution. J. Geophys. Res. 117, E00L03. http://dx.doi.org/10.1029/2012JE004100. Murchie, S.L., Watters, T.R., Robinson, M.S., Head, J.W., Strom, R.G., Chapman, C.R., Solomon, S.C., McClintock, W.E., Prockter, L.M., Domingue, D.L., Blewett, D.T., 2008. Geology of the Caloris basin, Mercury: A view from MESSENGER. Science 321, 73–76. http://dx.doi.org/10.1126/science.1159261. Murray, B.C., 1975. The Mariner 10 pictures of Mercury: An overview. J. Geophys. Res. 80, 2342–2344. http://dx.doi.org/10.1029/JB080i017p02342. Ostrach, L.R., Robinson, M.S., 2014. Areal crater density analysis of volcanic smooth plains: Mare Imbrium, a revised approach. Lunar Planet. Sci. 45, abstract 1266. Ostrach, L. R., Robinson M. S., Whitten, J. L., Fassett,C. I., Strom, R. G., Head, J. W., and Solomon, S. C., 2015. Extent, Age, and Resurfacing History of the Northern Smooth Plains on Mercury from MESSENGER Observations. Icarus 250, 602-622. Pike, R.J., 1988. Geomorphology of impact craters on Mercury. In: Vilas, F., Chapman, C.R., Matthews, M.S. (Eds. ), Mercury. University of Arizona Press, Tucson, Ariz., pp. 165–273. Robinson, M.S., Murchie, S.L., Blewett, D.T., Domingue, D.L., Hawkins, S.E., Head, J.W., Holsclaw, G.M., McClintock, W.E., McCoy, T.J., McNutt, R.L., Prockter, L.M., Solomon, S.C., Watters, T.R., 2008. Reflectance and color variations on Mercury: Regolith processes and compositional heterogeneity. Science 321, 66–69. http://dx.doi.org/10.1126/science.1160080. Solomon, S.C., Head, J.W., 1980. Lunar mascon basins: Lava filling, tectonics and evolution of the lithosphere. Rev. Geophys. Space Phys. 18, 107-141. Spudis, P.D., Guest, J.E., 1988. Stratigraphy and geologic history of Mercury. In: Vilas, F., Chapman, C.R., Matthews, M.S. (Eds. ), Mercury. University of Arizona Press, Tucson, Ariz., pp. 118–164. Strom, R.G., 1977. Origin and relative age of lunar and Mercurian intercrater plains. Phys. Earth Planet. Inter. 15, 156–172. http://dx.doi.org/10.1016/0031-9201(77)90028-0. Strom, R.G., Neukum, G., 1988. The cratering record on Mercury and the origin of impacting objects. In: Vilas, F., Chapman, C.R., Matthews, M.S. (Eds. ), Mercury. University of Arizona Press, Tucson, Ariz., pp. 336–373. Strom, R.G., Murray, B.C., Belton, M.J.S., Danielson, G.E., Davies, M.E., Gault, D.E., Hapke, B.W., O’Leary, B., Trask, N.J., Guest, J.E., 1975a. Preliminary imaging results from the second Mercury encounter. J. Geophys. Res. 80, 2345–2356. http://dx.doi.org/10.1029/JB080i017p02345. Strom, R.G., Trask, N.J., Guest, J.E., 1975b. Tectonism and volcanism on Mercury. J. Geophys. Res. 80, 2478–2507. http://dx.doi.org/10.1029/JB080i017p02478. Strom, R.G., Chapman, C.R., Merline, W.J., Solomon, S.C., Head, J.W., 2008. Mercury cratering record viewed from MESSENGER’s first flyby. Science 321, 79–81. http://dx.doi.org/10.1126/science.1159317. Strom, R.G., Banks, M.E., Chapman, C.R., Fassett, C.I., Forde, J.A., Head, J.W., Merline, W.J., Prockter, L.M., Solomon, S.C., 2011. Mercury crater statistics from MESSENGER flybys: Implications for stratigraphy and resurfacing history. Planet. Space Sci. 59, 1960–1967. http://dx.doi.org/10.1016/j.pss.2011.03.018. Taylor, B., 2006. The single largest oceanic plateau: Ontong Java-Manihiki-Hikurangi, Earth and Planetary Science Letters 241, 372-380. Taylor, S.R., 1989. Growth of planetary crust. Tectonophysics 161, 147-156. Trask, N.J., 1975. Cratering history of the heavily cratered terrain on Mercury. Geol. Romana 15, 471–476. Watters, T.R., 1993. Compressional tectonism on Mars. J. Geophys. Res. 98, 17049–17060. http://dx.doi.org/10.1029/93JE01138. Watters, T.R., Solomon, S.C., Klimczak, C., Freed, A.M., Head, J.W., Ernst, C.M., Blair, D.M., Goudge, T.A., Byrne, P.K., 2012. Extension and contraction within volcanically buried impact craters and basins on Mercury. Geology 40, 1123–1126. http://dx.doi.org/10.1130/G33725.1. Whitten, J.L., Head, J.W., Denevi, B.W., Solomon, S.C., 2014. Intercrater plains on Mercury: Insights into unit definition, characterization, and origin from MESSENGER datasets. Icarus 241, 97–113. Wilhelms, D.E., McCauley, J.F., 1971. Geologic map of the near side of the Moon. Map I-703, Misc. Investigations Ser., U.S. Geological Survey, Denver, Colo.
Wilson, L., Head, J.W., 2003. Lunar Gruithuisen and Mairan domes: Rheology and mode of emplacement. J. Geophys. Res. 108, 5012, doi: 10.1029/2002JE001909. Wilson, L., Head, J.W., 2008. Volcanism on Mercury: A new model for the history of magma ascent and eruption. Geophys. Res. Lett. 35, L23205. http://dx.doi.org/10.1029/2008GL035620. Wilson, L., Head, J.W., 2012. Volcanic eruption processes on Mercury. Lunar Planet. Sci. 43, abstract 1316.